The story about Cat Grandpa, otherwise known as De Pere resident Terry Lauerman, 75, has gone viral (featured on BBC, Good Morning America and more national news outlets) for his daily routine of going to the pet shelter and taking naps while surrounded by cats. Lauerman was featured in a Facebook post published by Safe Haven Pet Sanctuary Inc. on Tuesday that has attracted the attention of many. As of Friday morning, the post has garnered over 31,000 likes, 17,00 shares and 5,000 comments. The Cat Grandpa has taken the media by storm, having been featured on the popular site BuzzFeed and being covered by Good Morning America on Thursday. Lauerman, an official volunteer at the shelter, first started visiting Safe Haven Pet Sanctuary in 2016. He has since become an expert cat brusher, spending most days at the shelter for hours at a time. Not only does he enjoying brushing the cats, but the cats benefit greatly from the interaction. After graduating from UW-Green Bay in 2015, Feldhausen (Psychology and Human Development) decided to make her dream of opening an animal rescue a reality. 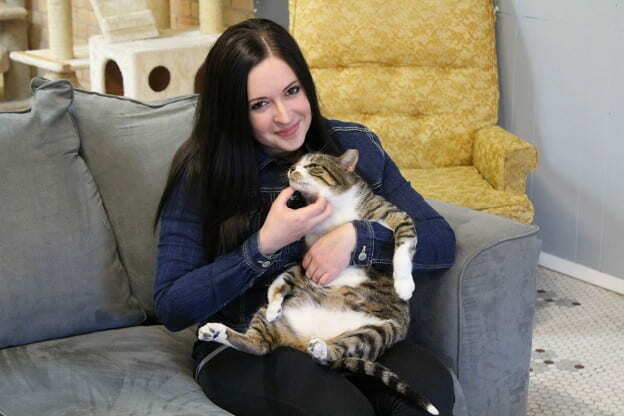 The Safe Haven Pet Sanctuary and Cat Café is a non-profit, no-kill and no-cage pet sanctuary, and the Cat Café was the first in the region and allows customers to enjoy a beverage and the company of cats at the same time. Her story has been previously featured on Inside UW-Green Bay News. Safe Haven Pet Sanctuary and Cat Café is located at 151 N. Broadway, Green Bay. It is open Tuesday through Friday from 12 p.m. to 6 p.m., Saturday from 12 p.m. to 3 p.m. and is closed on Sunday and Monday. Connect with them through their website, Facebook and Instagram. They can be contacted by email safehavenpetsanctuary@gmail.com or by phone at 920-489-2462. This entry was posted in Giving Back and tagged CAHSS, Human Development, Psychology on September 25, 2018 by Sue Bodilly.